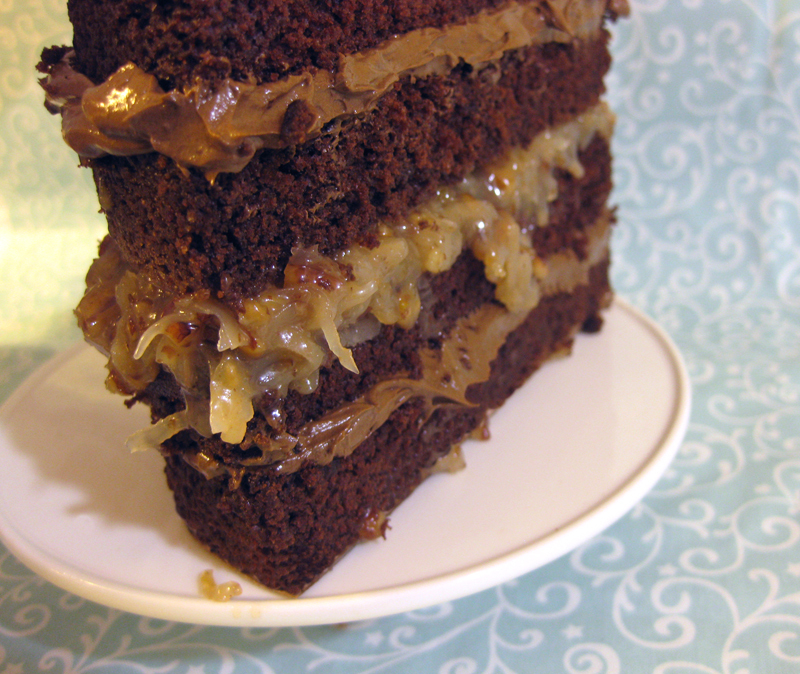 Hello, my name is German chocolate cake. I am an insanely chocolatey delight. A slice of me consists of four layers of super moist chocolate cake separated by layers of creamy chocolate Italian meringue buttercream. My mid section is undoubtedly the most delicious part as it is filled with a carmel-like custard mixed with toasted coconut and toasted pecans. These are simply my insides. I can be covered in even more chocolate buttercream if you’re a die-hard chocolate lover. I am also quite delicious covered in vanilla buttercream and wrapped in Amanda’s homemade marshmallow fondant. And yes, I a really am as delicious as I look. This looks so yummy……….. wish i could grab it from the screen and eat it right now…….. YUM!